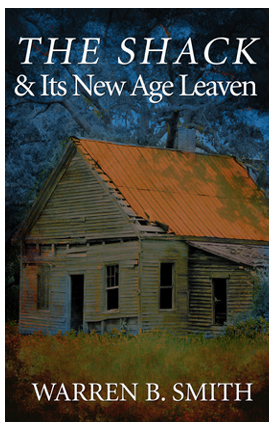 The Shack and Its New Age Leaven written by Warren B. Smith is our newest Lighthouse Trails Print Booklet Tract. The booklet tract is 14 pages long and sells for $1.95 for single copies. Quantity discounts are as much as 50% off retail. Below is the content of the booklet. To order copies of The Shack and Its New Age Leaven, click here. Described as a Christian novel, The Shack, written by William Paul Young, sat on the New York Times bestseller list for over 172 consecutive weeks (including 52 weeks at #1), and over 10 million copies of the book are in print.1 Many Christians have purchased multiple copies and given them to friends and family. The Shack reads as a true story, but is obviously allegorical fiction. The book conveys postmodern spiritual ideas and teachings that challenge biblical Christianity—all in the name of “God” and “Jesus” and the “Holy Spirit.” Author William P. Young’s alternative presentation of traditional Christianity has both inspired and outraged his many readers. All the while his book continues to fly off the shelves of local and online bookstores. Much like New Age author James Redfield’s book The Celestine Prophecy, The Shack is a fictional vehicle for upending certain religious concepts and presenting contrary spiritual scenarios. Allegorical novels can be a clever way to present truth. They can also be used to present things that seem to be true but really are not. Some books like The Shack do both. A few years ago, when I was speaking at a church service, a woman named Jennifer approached me and told me she had discovered something interesting in The Shack and had written a short article about it. She asked if I would be willing to read her article. I told her I would. In the movie The Seeker a young boy is a chosen one who is to find signs hidden throughout time, which will help fight against the encroaching darkness. . . . [I]n the movie, each sign that the boy is to find is known as a fractal. When I heard the term fractal, right away I realized that I had heard that same term somewhere else recently. . . . I remembered where I had heard it, The Shack. Curious about the term “fractal” that was showing up in both The Shack and The Seeker, Jennifer did some research. What she discovered is that the term “fractal” is directly related to what are being called the “new sciences” of “Chaos Theory” and “Fractal Theory.” What was of particular interest to me was her finding that fractals are directly linked with the occult phrase “as above, so below.” Given my previously expressed concern about Peterson’s use of “as above, so below” in The Message, I found it interesting that “as above, so below” was apparently related to the term fractal in The Shack. Thus, The Shack subtly introduces the New Age/New Spirituality as a worldview that puts forth the notion that “chaos” can be significantly overcome when humanity stops seeing itself as “separate”21 but rather sees itself as “One”—as a part of the “God” who is “in” everyone and everything. However, the Bible teaches that humanity is not “God” or “One” with God (John 2:24-25; Ezekiel 28:2; Hosea 11:9, etc.). The Bible teaches just the opposite—that man is actually separated from God by sin (Isaiah 59:2). It is because of this “separation” that we need to acknowledge our sin and repent (Acts 2:38). Everyone must be born again (John 3:6-7)—born again from the God who is “above” (John 3:31), and not “below.” Born again from the one true God—not by the “as above, so below” god that the Apostle Paul described as “the god of this world” (2 Corinthians 4:4). The Bible states that we are only “one” in Christ Jesus (Galatians 3:28). And we are only “one” in Christ Jesus when we repent of our sins and accept His death on the cross for our sins (1 John 2:2)—his finished work on the cross of Calvary (Colossians 1:20). Acts 17:26 informs us that humanity is “one blood” and that we are connected to one another in that way. But humanity is not one Spirit. “That which is born of the flesh is flesh; and that which is born of the Spirit is spirit” (John 3:6). The Bible states that “flesh and blood cannot inherit the kingdom of God” (1 Corinthians 15:50). Jesus said, we “must be born again” (John 3:7). God’s creation is indeed intricate and wondrous. And in many countless ways it is beautifully and harmoniously interconnected—but it is not divine (Romans 1:25). Man is “fearfully and wonderfully made” (Psalm 139:14), but he is not a part of some divine fractal order. We are sinners, and we need to be saved from the sin that separates us from God. It is as simple as that. Repenting and accepting Jesus Christ as our Lord and as the one and only Savior who saves us from our sins is the “narrow” and only way to eternal salvation (John 14:6; Matthew 7:13-14). The introduction of fractals in the story line of The Shack is a deceptive device to unsuspecting readers. It is an entry point into the pseudo-scientific notion of “fractal Oneness”—“as above, so below”/God “in” everything. To order copies of The Shack and Its New Age Leaven, click here. 1. Windblown Media’s website, January 2012 stats, http://windblownmedia.com/news-releases/56-the-shack-continues-at-1-on-the-ny-times-best-seller-list.html. 2. Warren B. Smith, Deceived on Purpose (Mountain Stream Press, Magalia, CA), p. 32 citing from As Above, So Below, p. xi. 3. Benjamin Crème, The Reappearance of the Christ and the Masters of Wisdom (London, England: The Tara Press, 1980), p. 88. 4. Alice Bailey, The Reappearance of the Christ (New York, New York: Lucis Publishing Company), p. 88. 5. Robert Schuller, Hour of Power, November 9, 2003. 6. Rick Warren, The Purpose Driven Life (Grand Rapids, MI: Zondervan, 2002), p. 88. 7. Saddleback Foundations Participants Guide, p. 46. 8. William P. Young, The Shack (Newbury Park, CA: Windblown Media, 2007), p. 112. 9. Harry Ironside, (quoted in The Berean Call newsletter, April 2008). 10. William P. Young, The Shack, op., cit., p. 129. 12. Jennifer Pekich, “Fractal Theory in The Shack” (unpublished article; used with author’s permission), quoting in part from: The Shack, op. cit., p. 129. 13. Referring to Larry DeBruyn. Visit his website at http://guardinghisflock.com. 14. “Fractal Chaos Crashes the Wall between Science and Religion,” http://www.fractalwisdom.com. 15. Rick Warren, The Purpose Driven Life, op. cit., p. 248, quoted in: Warren Smith, Deceived on Purpose, op. cit., pp. 108-109. 16. “Fractal Chaos Crashes the Wall Between Science and Religion,” op. cit., quoting Aldous Huxley. 19. William P. Young, The Shack, op. cit., p. 138. 21.For a more complete explanation of separation versus oneness see Chapter 9, “The New Age Doctrine of Separation” in False Christ Coming: Does Anybody Care? by Warren B. Smith.